Rachel Pernic Waldron is a partner at Rakoczy Molino Mazzochi Siwik LLP. Ms. Pernic Waldron’s entire legal career has been largely focused on patent litigation. She holds a Bachelor of Science in Chemistry, and a minor in Biology. She performed undergraduate research in analytical chemistry (mass spectrometry), and interned for a large chemical company in its analytical chemistry department. Ms. Pernic Waldron joined RMMS in May 2010. Since that time, Ms. Pernic Waldron has been involved in approximately twenty-five (25) Hatch-Waxman matters. She has extensive experience in every facet of Hatch-Waxman litigation, including fact and expert discovery, drafting (e.g.) Markman, Daubert, mediation, and appellate briefs, arguing motions and Markman hearings, handling court-ordered mediations, managing pre-trial activities, preparing witnesses, and conducting both direct and cross examinations at trial. 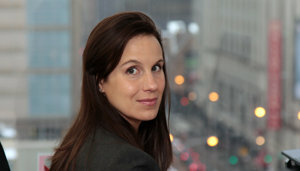 Prior to joining RMMS, Ms. Pernic Waldron was a partner at Kirkland & Ellis LLP, where she concentrated her practice on patent litigation, and gained extensive patent litigation experience in a variety of different technologies, including medical devices, chemical reactors, microprocessors, engine technology, cosmetics, and hearing protection. In addition, Ms. Pernic Waldron has represented clients in a wide variety of commercial litigation matters, including matters involving breach of contract, fraud, unfair competition, common law conversion, false advertising, and trade secret misappropriation. Ms. Pernic Waldron also has substantial patent counseling experience, particularly in matters concerning freedom to operate, and patent portfolio assessment and management. She also has considerable experience preparing formal opinions of counsel. Prior to joining RMMS, Ms. Pernic Waldron was a partner at Kirkland & Ellis LLP. Prior to attending law school, Ms. Pernic Waldron served as a chemical purchasing agent at Sigma Chemical Company in St. Louis, Missouri. She also obtained laboratory experience by working as an intern quality assurance chemist for Sigma, and as a research assistant for the Indiana University Chemistry Department.